Something is seriously off in the Watkins home. And Julie Seagle, college freshman, small-town Ohio transplant, and the newest resident of this Boston house, is determined to get to the bottom of it. When Julie's off-campus housing falls through, her mother's old college roommate, Erin Watkins, invites her to move in. The parents, Erin and Roger, are welcoming, but emotionally distant and academically driven to eccentric extremes. The middle child, Matt, is an MIT tech geek with a sweet side... and the social skills of a spool of USB cable. The youngest, Celeste, is a frighteningly bright but freakishly fastidious 13-year-old who hauls around a life-sized cardboard cutout of her oldest brother almost everywhere she goes. Okay, so I may skimmed the blurb for this when I bought it. I apparently missed the part that says there's a bit of mystery because I spent part of the book going... "Uh huh, something is not adding up here. I bet I know the deal." (I totally did know.) Be that as it may, I still really enjoyed Flat-Out Love. This book was incredibly hard to put down for me. 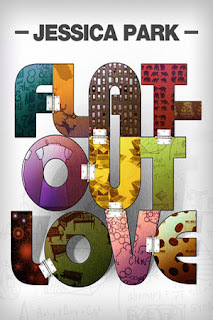 With a title like Flat-Out Love, I was expecting a fun and light romance. While it is that, there's also a bit more to it. There's some raw emotional stuff going on (though it's not too deeply explored). Like I said previously, there's also a bit a mystery to the story, but I'm not sure I'd really count that. It was so glaringly obvious that counting it seems silly. Anyway, it was a great mix that I thoroughly enjoyed. Even though I'm happy overall with the book, I did feel the ending was a bit rushed. Things just came together too quickly for it to seem very genuine to me. I guess I could understand it, but I think a few more chapters could have given a better, more fleshed out ending than what was there. Though I'm going to read the short companion piece, Flat-Out Matt, I'm more excited to read Flat-Out Celeste as she was certainly my favorite character in the entire book.